City University wants to review Friday prayers ‘sermons’ for ‘appropriateness’ BEFORE they are delivered. 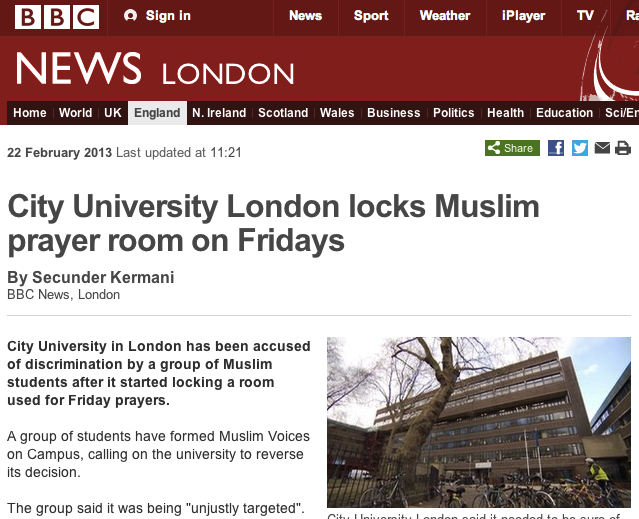 I’ve just come across this odd little story that City University have locked their Muslim Prayer Room, as the students using the room have refused to submit their Friday prayer ‘sermons’ for vetting for ‘appropriateness’ before they are delivered. The BBC story suggests that three years ago there was some evidence of extremist views amongst City’s Islamic students but seems to be no indication of that being the trigger for the current ‘lock-out’ . Given what I teach I have fairly strong views on what university should be about, and it seems to me that this story goes straight to the heart of this question. I’m slightly bewildered that a university’s administration could set themselves up as arbiters of what is ‘appropriate’ to be said on university premises. Surely, unless there is evidence that the law is being broken, university should be the very place where anything can be said. I can think of several groups who would find the things I say in lectures very inappropriate (homeopaths, creationists, conspiracy theorists) and ye tI don’ t see any of my institution’s management wanting to pre-screen what I teach. ← NHS seems to think homeopathy isn’t too bad !